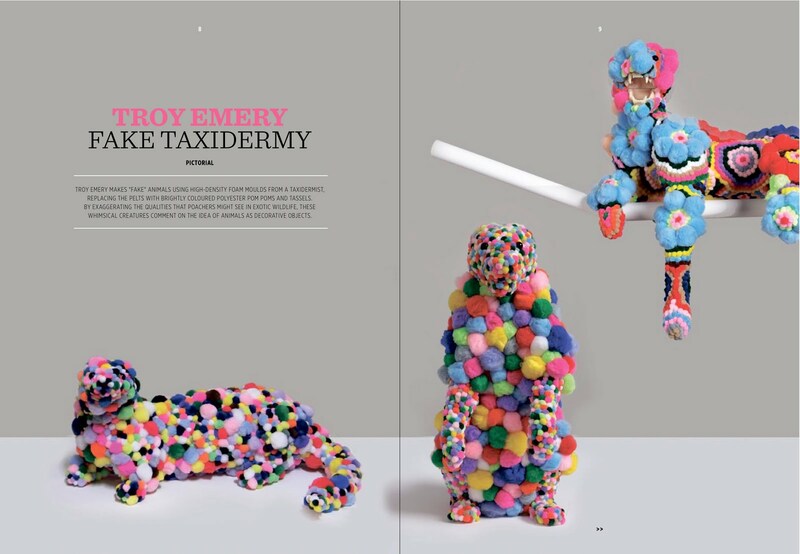 Troy Emery: Troy Emery – Fake Taxidermy. (2011, April). das SUPER PAPER, issue 18, p8 – 10. Troy Emery – Fake Taxidermy. (2011, April). das SUPER PAPER, issue 18, p8 – 10. Troy Emery is an artist based in Melbourne and has an object based sculptural practice. He grew up in Toowoomba Queensland but relocated to Hobart to attend art school. He graduated from a Bachelor of Fine Art (hons) at the Hobart School of Art, University of Tasmania in 2005. Troy then completed a Masters of Fine Art at Sydney College of the Arts, University of Sydney in 2010. 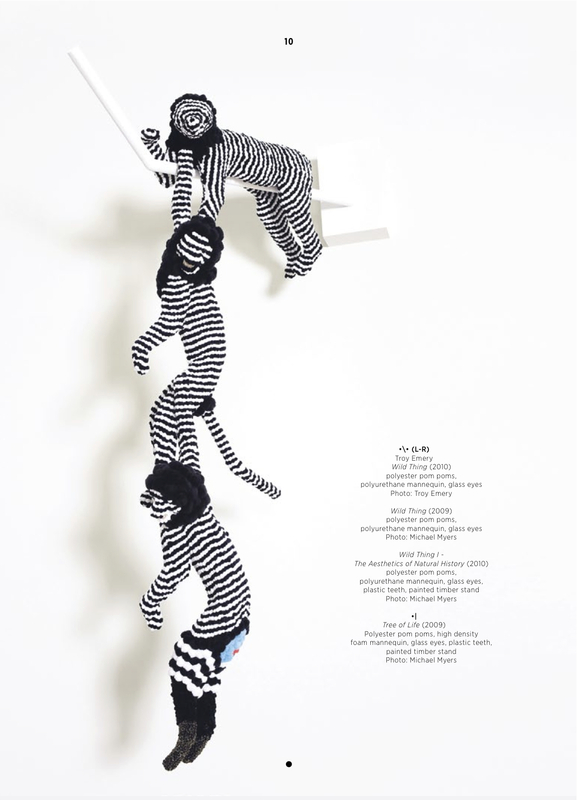 Troy Emery creates suites of artworks where dislocated animal forms are brought together as a collection through a uniform approach in their construction and materials, becoming pastiches of each other and the idea of a collection of animals itself. Troy Emery’s work is about how the history of our relationship with animals is underpinned by our ability to give meaning to them and use them in allegory and metaphors. A tension between decoration and representation is present when looking at animals. They are not only living creatures: Animals can be seen as decorative objects. Pets decorate living spaces, furs decorate the body, animal patterns decorate furniture, taxidermy decorates the museum diorama, and hunting trophies decorate the hunter. Emery refers to his sculptures as ‘fake taxidermy’ because they mimic the process of taxidermy without actually producing a real result. The particular animals he chooses to work with fall between being exotic and easily recognisable. The taxidermy mannequins used represent species including mountain lions, wolverines, and foxes but with the addition of their colourful pelts they become harder to classify. The colours of his animals are like those of exotically coloured birds of paradise prized for the vibrancy of their feathers. Some of the animal’s poses and statures seem aggressive, contradicting their soft, colourful costumes – just as in nature where many soft, cuddly animals can be quite unpleasant up-close. As in the menagerie or a zoo, the primary concern is with appearances. For Emery, his animal sculptures represent his interest in the importance of surface in taxidermy and the way we view animals as decorative objects. The role of surface and colour in the production of these sculptures is an exaggeration of the qualities sought after in exotic wildlife. The luscious pompom pelt is a camp interpretation of the way skins and furs are cherished and fetishised. As natural specimens or species, His animal sculptures are impossible combinations of form, colour, and materials. They can only exist as hypothetical or mythological animals. What fascinates Emery about these areas of investigation is that there is, especially historically, a place for fantastical, fake animals.